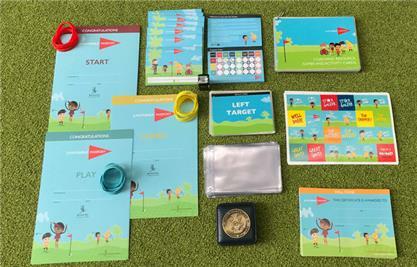 Following a period of consultation with PGA professionals, parents, and children throughout 2018, the Golf Foundation is delighted to announce the Junior Golf Passport has been improved and relaunched in April 2019. The new physical 28-page booklet is rich in content with major modernisations to excite the next generation of players, aged 6 -12, and their families. Meanwhile, the online version of the Passport has been revamped radically – becoming a resource now purely to support the PGA coach: a Coaches’ Locker Room and Shop are packed with coaching resources to facilitate the busy club professional and inspire his/her students as they learn the game. These include everything from achievement stickers to the introduction of a Skills for Life Medal so coaches/clubs can reward commitment and sportsmanship. An exciting new area includes progressive skills testing across all playing disciplines, where coach and student can work together as the young golfers improve week-on-week through the Passport’s pages. Coach and child can ‘stamp’ the Passport as each new technique is learned. This innovation helps enhance coaching opportunity for the PGA pro while building confidence for the student, maintaining and increasing interest. The Passport comes with a smart new wallet to maintain top condition, while the coach can print out award certificates and specific coaching tips that can be inserted into the Passport’s pages. Following feedback from coaches and families, the 2019 Passport offers key new sections for the young player who is growing up in a world of technology: including a guide to the terminology around how a golf club works (driver and iron), different types of ball flight (from hook to slice), how to record yardage for shotmaking and more. A further new area focuses on developing ‘Skills for Life’, including an understanding of sportsmanship; while the ‘Milestones’ section is where boys and girls can record ‘first golf lesson’, first par, first birdie, first handicap, favourite hole, favourite golfer and more as their appreciation of the sport grows. If you would like further information please contact your local Regional Development Officer.